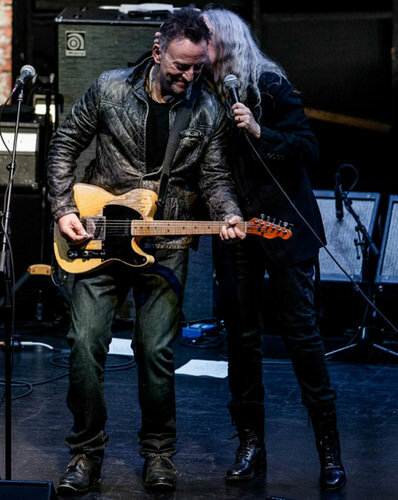 Bruce had a guest appearance during a show with Patti Smith. Bruce plays piano or guitar on all the tracks of the setlist mentionned under, a mixture of spoken word, poems and songs. At the early show, "Slowly Walking Down The River" and "My Car Was Invisible (Case Of Bruce Springsteen)" are improvised, semi-spoken-word pieces performed by Smith with Bruce on piano. "Picture Hanging Blues" features Bruce on piano and Lenny Kaye on guitar. The full Patti Smith Group joins starting on The Velvet Underground's "We're Gonna Have A Real Good Time Together", which features Bruce on piano. He returned later in the show to play guitar on several more songs, believed to have been those listed underneath. A fan present at the late show recalls "Bruce mostly played guitar since John Cale was on piano for most songs. A few of my photos do show Bruce at the piano however." 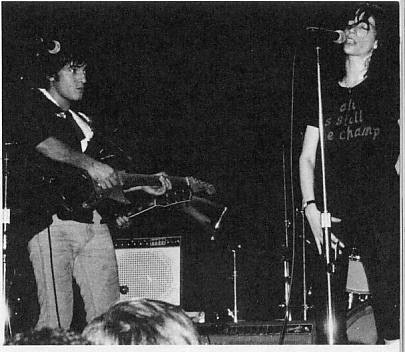 Ain't it strange is a song taken from the 1976 second studioo album of Patti Smith. 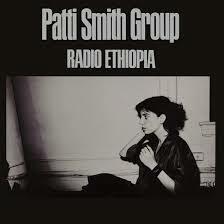 Radio Ethiopia was the follow-up record to Smith's widely acclaimed debut Horses. In interviews surrounding the album's release, Smith explained that she chose producer Jack Douglas in hopes of making the album a commercial success. The album was negatively received when it was released and Smith was attacked by critics for what they perceived to be laziness, self-indulgence and selling out. The title track of the album is one of Smith's most notorious songs, almost legendary for appearing to be "10 minutes of noise". Critics often described live renditions of the song as negative moments of Smith's concerts. Patti herself spoke highly of the track and of how the lyrics refer to Arthur Rimbaud's dying wishes. Arguments both for and against the song have been advanced by critics, fans and music listeners over whether the song truly is an example of the Patti Smith Group's boundary-pushing or merely self-indulgence. Critics in negative reviews cited that Douglas' production placed more emphasis on creating a heavy sound through numerous guitar parts which smothered Smith's vocals and, at times, lamented that all of the album's songs were originals of the group (Smith co-wrote much of the album with bassist Ivan Kral, the band member keenest for commercial success. "Ain't It Strange" and "Distant Fingers", the latter co-written with Smith's long-time boyfriend Allen Lanier, had both been staples of the Group's concerts long before the recording of Horses. The album's cover photograph is by Judy Linn, the back of the album features a photo by Lynn Goldsmith. 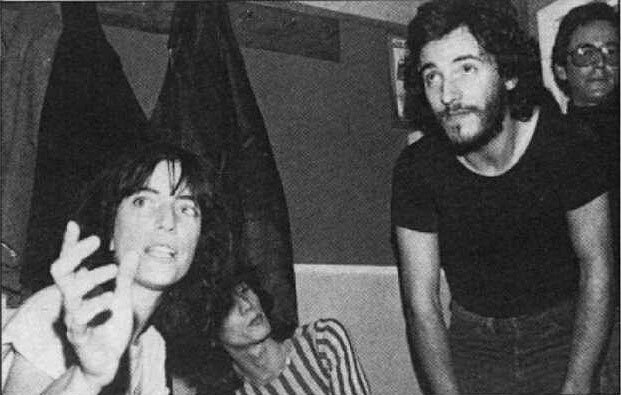 Bruce has one co- written song with Patti Smith : Because the night. It was originally recorded during the Darkness On The Edge Of Town sessions. The song was officially released for the first time in a live version on the Live/1975-85 box set in 1986 recorded at Nassau Veterans Memorial Coliseum, Uniondale, NY, during The River Tour. The guitar solo part is edited out on the official release, from three minutes to a bit over a minute and a half. The live 28 Dec 1980 version was also included on the Greatest Hits (2009 Europe edition) compilation album. A studio version was released on The Promise in 2010. 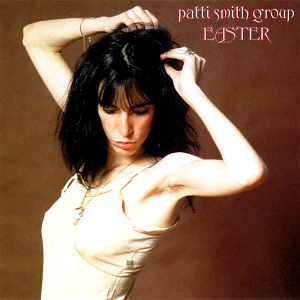 Because the night was donated to Patti Smith for her 1978 album Easter. I impure thee, come explore me. And they come and they call and they crawl on the floor. True, true, who are you? Girl in white dress, boy shoot white stuff. That I'll never end transcend transcend. Do you go to the temple tonight? Do you not go to the palace of answers with me Marie?